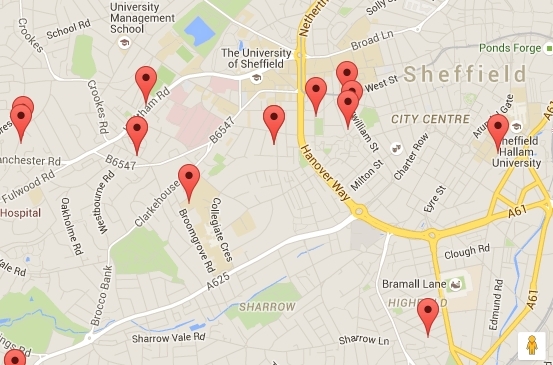 Brilliant location for SHU Collegiate Campus, with the vibrant Ecclesall Road on the doorstep too! Newly completed apartments offering student accommodation in Sheffield, with a fantastic location right on West Street! West One Student Accommodation is an established family run business providing top quality private student accommodation for more than 1,200 students in Sheffield. We are property owners and not letting agents, so we really care about our properties and make sure they are well maintained and cared for. In our experience location is the key factor for convenience during your student years, and therefore you will find all our student properties are in “The Places to be” such as Broomhill, Crookesmoor, Broomhall, Ecclesall Road, the increasingly popular Sharrow/London Road area, and of course Sheffield City Centre.